Whenever you need to write some article or a piece of text that’s going to be seen somewhere, the first thing you (should) ask yourself is: which font am I going to use? If you plan on using more than one font, you should know some basic things about choosing and matching more fonts. There is no right or wrong way to choose or match more than one font for a written piece. Still, like the basic typographic rules mentioned in our Typography 101 article, there are some standards that generally result in visually attractive and readable letter formations. Like most general guidelines, these may not always apply to your project, but nine out of ten times they will at least help you eliminate the least functional combination as well as some critical errors. Before I spring some heavy typography knowledge on you, I’ll introduce some basic typographic terms such as typeface and type classification. After reading this you will understand how seemingly small changes in type design can greatly affect the look and feel of whatever it is you are writing. If you have ever read anything about typography, you probably came across both of these terms and might wonder what the difference is. Well, a typeface is a set of typographical symbols and characters that share common design features. It includes letters, numbers and any special characters which we use to put together words and sentences on paper and screen. A font is generally defined as a complete character set within a typeface. It comes in a specific size and style. For example, ITC Garamond Bold Condensed Italic is a different font from ITC Garamond Condensed Italic, but both fonts are within the same typeface – ITC Garamond. And ITC Garamond is a different typeface from Adobe Garamond or Monotype Garamond. So when people talk about fonts, what they are really talking about are typefaces or type families (groups of typefaces with similar or related design). 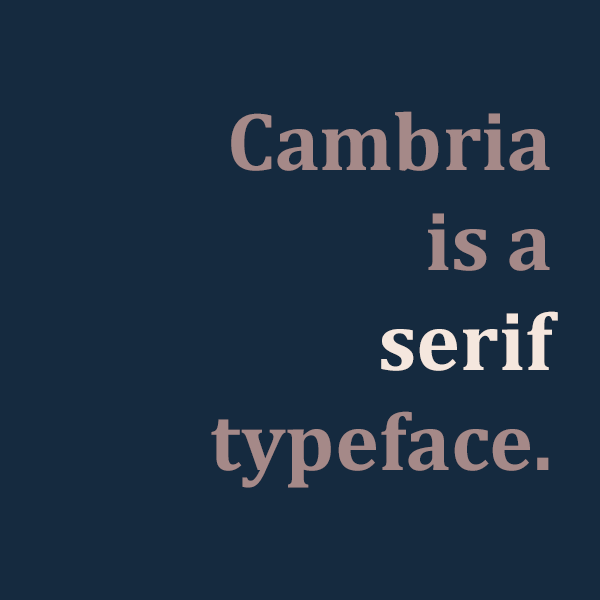 This is a pretty wide topic and it keeps expanding with all the new fonts and typefaces that are emerging these days, so I’ll stick to the basic classification such as: serif, sans-serif, script, display and others. Typefaces can also be classified based on their technical specifications, such as proportional vs. monospaced, or even by the mood they bring into the visual component. Serif typefaces are called serifs because of the small lines at the endings of the main strokes of characters. They are mostly used for body text in print because they are easy to read and pleasant to the eye. They are also implemented on the web for body text or headlines. There are a lot of divided opinions on serifs readability online and some designers prefer not to use them for longer paragraphs of text. There are many sub-types within the serif classification. Old Style is one of the most exciting periods in type history. It contains some of the oldest typefaces, dating back all the way to the 1400s and shows a significant departure from calligraphic roots. Thick strokes and heavily bracketed serifs characterize Old Style types. They are generally sharp in appearance. Some of the popular typefaces from this category include Garamond, Adobe Jenson, and Goudy Old Style. Transitional serifs date back to the 1700s and show more contrast between thick and thin strokes of characters. They also come with heavily bracketed serifs. Some of the popular typefaces from this category are Times New Roman and Baskerville. Transitional serifs are the most common serif typefaces. Modern serifs come with even more reduced thin strokes (increased contrast to thick strokes) and extremely thin serifs. They appear very elegant and eye-catching. Now you can see how these classifications were formed. Claude Garamond did not consider himself a designer of Old style typefaces, nor did Baskerville consider himself a designer of Transitional typefaces. By studying these typefaces, designers were able to notice the changes in style that evolved during time, and scholars came to categorize Garamond as Old Style and Bodoni as a Modern typeface. Baskerville was, and still is, considered the bridge between these styles so it became known as a Transitional typeface. After Bodoni, type design went crazy. Typographers were in constant search for new forms and ways of expression, so all kinds of bold, extended, condensed and decorative typefaces were created. One of the styles that emerged was Egyptian, also called slab serif or square serif. Slab serifs contain little to none contrast between thin and thick strokes. Extremely heavy serifs characterize the letters in this category. Before the twentieth century, sans serif typefaces were rarely used and usually limited to display use. Somewhere in the mid-twentieth century, they became insanely popular because of their refined and modern design. Still, they were considered inappropriate for general text usage. Today they are commonly used for print as well as for display. Helvetica is the most widely used of all sans serif typefaces, and the Helvetica family is probably the most diverse of all type families. Grotesque is a group of sans serif typefaces from 1800s to early 1900s. A lot of these typefaces exist only in capitals or in extremely old specimen books. Still, some of them are commonly used (Franklin Gothic). These typefaces are characterized by very awkward character weight distribution and irregular curves. Some of the most used typefaces from this group are Franklin Gothic, Monotype Grotesque and Schelter Grotesk. Just as the name implies, Neo-Grotesque is a group of typefaces with a modern design based on grotesque types. It is also called Transitional (in terms of sans-serif classification) or Realist and includes some of the most commonly used sans. They are based on the late Grotesques with more careful construction and a new feel for aesthetics. It is a group of neutral and simple typefaces which was popular among the Modernists, and still is today. The group differs from Grotesque with the loss of awkward curves and wide varieties in weight distribution. Popular typefaces from this group are Highway Gothic, Bell Centennial, Arial, Helvetica and MS Sans Serif. Humanist typefaces are the most calligraphic of the sans-serif typefaces. They are characterized by some variation in line width and the fact that they are more legible than other sans-serif fonts. The Humanist sans group includes typestyles like Gill Sans, Myriad, Trebuchet, Tahoma, Verdana and Calibri. Geometric typestyles are, just as their name suggests, geometric shapes combined to create characters. They can be recognized by the optically circular letter “O” and are otherwise very rectangular. The first typeface ever to be recognized as Geometric sans was designed by Jakob Erbar. Erbar-Grotesk was released in the 1920s with the intention of being very legible but became known the pioneer of the least legible typeface group. This group includes typestyles like Kabel, Nobel, ITC Avant Garde, Century Gothic, Gotham and Futura. There are a lot more classifications like Decorative, Stencil, Script, Freestyle, Blackletter and others, but we have covered the main ones. So now that we’ve got that covered we can implement our newly found knowledge to create great examples of mixing typefaces. As you have seen so far, typography knows no borders, and creating great typefaces as well as typeface combinations is a matter or art. If you apply all the basic rules, you will most likely end up with a suitable combination for your project. If you add a little crazy and out-of-the-box design, you just might end up with something great! There is a great deal of tips and techniques that help you end up with a good typographic result. Some of them say that all you need to do is pair a Serif with a Sans Serif, some that you need to achieve contrast no matter which classification you use, while others will tell you to combine font moods etc. I will lead you through what I believe are successful tips for mixing typefaces (not that other ones are less successful, it’s just that I’ve implemented these enough times to know they really do give good results). So what I’m trying to say here is that if you go with two to three typefaces from one superfamily (try to avoid combining more than three different typefaces on a single page), they will most likely work in harmony with others and can stand out as well, if needed. Here is a picture of Lucida Sans Regular (in red) and Lucida Bright Regular (in grey). You can see the obvious difference since one is a sans serif and the other a serif typeface, but you can also see the similarities that put these two in the same family. Another method for mixing typefaces is choosing those with similar visual characteristics and physical attributes. Similar typefaces create a constant mood for your copy and can transfer a message to the readers even before they start reading the text. When going for this method, you need to keep in mind not to choose too similar typefaces; you want your readers to notice the change in the typeface, not to think that you accidentally put a different letter ‘g’, for example, in the middle of a paragraph. With too many similar characteristics, readers won’t be able to tell the typefaces apart, and they will focus on the small change in details instead on the content itself. To achieve the balance with similar typefaces, it’s best to choose two that have some common features, such as the fact they both belong to the same class and have similar x-height. Or they don’t belong to the same class but come from the same time period and have the same contrast between thick and thin strokes. The goal here is to try and find some visual characteristics that will bond the two typefaces just enough for them to make your text look like a whole, and yet not as much so that readers can notice the change in type while they read. In this example we paired Clarendon Bold (headline) with New Baskerville (body), and the combination looks very neutral. New Baskerville is a transitional serif typeface and goes nicely with the heavy Clarendon. Although both are serif typefaces, the difference is obvious but not as much to make them look too distinct. And the third method is going all the way, that is using typefaces that don’t have anything in common. Emphasizing the contrast between your types can create a powerful visual component of hierarchy (mentioned in the previous post), and also unity. The big bold headline can be that one thing that catches the reader’s eye, the thing that gives a personality to your text, or you could always go with a subtle headline and then pair it with a playful typeface like Souvenir. Souvenir is playful, casual and very pretty! It works well with a typeface that doesn’t have a strong mood, like Futura. It’s pretty simple, it can adapt to many combinations and would look very well when paired with Souvenir. Contrast can also be achieved with type size or type style. You don’t necessarily need to use two different typefaces. You can simply make your header a bit bigger, bolder and lets say in italic style, and you already have contrast and attention. So to conclude all this, there are a lot of techniques and guidelines on how to mix typefaces, but, overall, it’s all about the context and your imagination. Like I said before, there are no strict rules to follow, just a few simple principles that can make your typographic choices much easier and help you achieve anything from a solid to extremely good looking typographic result.